wow. now this one is awesome.fav! What's really nice is that he even used the Calvin and Hobbes title font for the title of this story. It definitely adds to the homage. I find it very ironic that Sari says "I'm the robot"...considering the outcome of the second season finalle. And I wonder if anyone noticed her eyes were hexagonal in that panel? I found that funny, too. Meant to ask the writer about it. Shouldn't Bulkhead be saying, "MOAR DANCING!!" Wasn't there a Calvin and Hobbes comic like this one? Yep, even says it was inspired by that in the first panel. now take these and make a Carmelladansan! LOL. Probably a bit better. Unfortunately the original Calvin & Hobbes strip didn't have a background. I love Ratchet banging on the comic panel lines. I thought something was familiar when I saw the title - hilliarious! 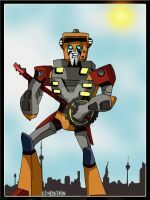 I'm Primus in the Transformers-Crew! I'm Galvatron in the TF club, !